We normally take their good players though. We had Bamford before and he was woeful then. He's just not as good as his reputation. Is it more important than Abraham turning an ankle and missing the playoffs? Or Kodjia doing a knee? or Grealish getting sent off and suspended? They aren't risking their better players to kill themselves securing home advantage. They'll rest half the team. Villa have won 10 straight. They aren't going to give much of a toss which way round the games come. They'd rather have a fresh Grealish, Kodjia, Abraham etc for the two legs after a rest on the final day, than go all guns blazing killing themselves for home advantage. Have a word with yourself. Why would Villa care about finishing 4th or 5th? They'll play West Brom either way. Not sure if I'm missing something, or you are Capt Pants! They aren't risking Tammy Abraham and Grealish etc because they're desperate for home advantage in second leg. They've won 10 straight. Unless the scum do us a favour at the weekend.... it feels like the stage is set for that one, although not worth betting on! IT WAS 5 POINTS UNTIL WE PICKED UP A POINT AND THEY PICKED UP NONE! Get the **** in. Canos did **** all in a Norwich shirt but might just have had a massive impact on our season and sent us up. So a little while back, my Dad decided we were going to sponsor the matchball and picked out the Sheff Weds game (I'm a teacher so holidays made it a bit easier for me). Outline of the day: Arrived at the ground (4:45pm) and introduced to Bill Punton who was our host for the day. He took us straight to the bar and got us a drink in the Directors Lounge, and we had a chat with him. He took us on a tour of the ground, and then for a meal in Delia's. He then escorted us to the Director's Box. He met us again at half time and again at full time. Part of the package was a picture on the pitch with the MOTM at the final whistle, and then a seat in the Gunn Club to be presented with a replica match ball by a player. Bill was with us the whole time. Bill was very engaging and entertaining, full of stories. He told us the best player he ever played against was George Best and recounted some brilliant anecdotes, about how he signed for us. He was playing for a local team in the Highland league, and the manager of Portadown was in Scotland on holiday and asked to take him to Ireland for a month's trial. He got chucked straight in the first team due to illness and the pitch was a mudbath and he couldn't do anything. Was persuaded to stay and see out the trial, scored 2 and then 3 for the reserves and got put back in the first team where he scored 2 in his next game and never looked back. He moved to Newcastle after they put a bag of cash on the table to stop him meeting with Arsenal (after Celtic had agreed to sign him then reneged due to his religion!) and then we picked him up from there and he played 8 years for us. We let him go as we didn't want to pay for an operation he needed but he refused to uproot his young family so stayed in Norfolk and trained with Norwich on a daily basis, just turning out for Sheffield Utd and then Scunthorpe on match days - totally different era. Meal in Delia's was off a limited menu but was excellent food. Bill was quite forthright in making sure there was plenty of wine and the service was fantastic. Tour of the ground was interesting - but pretty similar to the experience the mascots and Fan of the match get tbf. Only other legend I saw doing tours on that day was Mark Barham, the rest seemed to be media guys. There were LOADS of tours going on simultaneously. Got a half page bit in the programme which just said "Come on you yellows...." with the Children Always First logo underneath it. Disappointingly, the logo was TINY on the video screen pre-match (unless it was prominently displayed and we missed it, as we were a little bit late getting to seats, although they ran it again on the scoreboard at full time. Directors Box seats was a totally different experience of watching the match - padded seats, extra legroom and the noise seem to reveberate round. The banner and the flags in the Barclay looked absolutely unbelievable from there by the way. Great job all involved. Had to obviously tone down the language but was surprised how vociferous it got in there when we scored. Couldn't stop myself leaping out my seat a few times at some of the reffing and think I may have got a few sideways glances for that though! Barclay and River End alike sounded so loud from in there. Didn't meet Delia, although walked past her a few times and said hello. Michael Wynn-Jones stopped a couple times to chat to us briefly and came across very well, seems like a really nice bloke. We were sat on the other side of the box to Delia, and didn't spot any other famous faces in there. We were directly behind away dugout and Bruce came across as a whinging git, huffing and puffing and throwing his arms around at every decision. 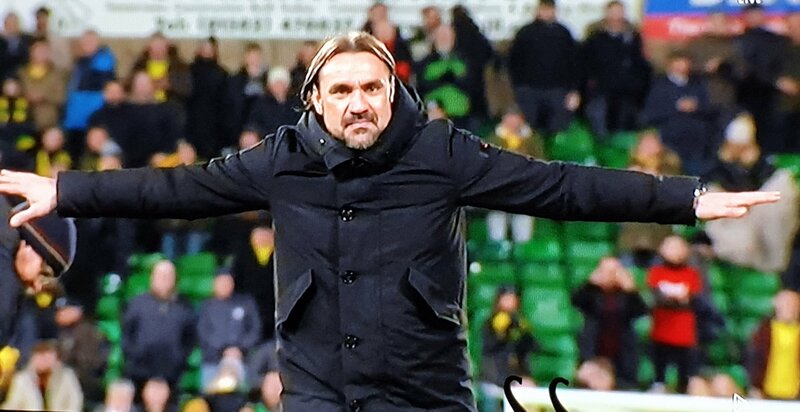 Farke was much calmer but in the ear of the 4th official constantly (not surprisingly given the atrocious reffing). Met Bill for another drink (which we pre-ordered and was waiting on the table) at half time and some fancy sausage rolls (which were unbelievably good - credit Delia). To be in position to get the photo on the pitch, Bill instructed us we had to go down when the 4th official held up the injury time board. We commented when he said that how dangerous it was given our penchant for late goals, and so it proved. We walked down and were watching on Skysports as Mario lined up that free kick. Unfortunately, the TV was on a 7second delay so we heard the roar from the stands and everyone was hysterically saying "He's done it.... hasn't he" before TV caught up and the lobby erupted in a delayed celebration. Went out on the pitchside immediately on the full time whistle, and saw Emi celebrating in the dugout. Stiepermann as MOTM should have had his picture with us but obviously wasn't clear on protocol, had a photo with a kid (possibly a mascot or something) and then took his shirt off and disappeared down the tunnel. There was a horrible moment when he took his shirt off that I envisaged the photo being with a sweaty Stiepermann in that bra type thing they wear for data tracking, but then he disappeared the PR guy said Don't worry, Mario's doing the SkySports interview, I'll grab him as he comes off. He did and we had a brief chat with Mario and thanked him for saving the day, to which he replied he was glad to hear it and got a picture with him on the pitch (which will be posted out in due course). My Stepmum and missus got some photos from the box of the moment though. Waiting for Mario I even managed to join in with the Farke wave from on the pitch which was totally surreal. After the game we went to a table in the Gunn club where we had our drinks waiting on the table. Cantwell came in and did the interview and then presented us with the match ball, which was another photo op. Thought Cantwell was a strange choice given he hadn't played on the day but he's a good lad, been a big part of the season and he's one of our own so no bother there, happy enough that it was him. A side note, Cantwell stayed around after his obligations were fulfilled to sign some stuff for people wanting autographs and take some selfies with fans which I thought was a decent thing for him to do. Matchball itself was not a replica match ball at all, but one of the cheap canary branded ones. Signed by the squad and in a plexiglass case which is pretty poor quality and difficult to carry. If you were one of those who spotted it as we made our way back to the hotel to drop stuff off then it was me and the family you saw, quite a few commented as we made our way up POW Road and Tombland (stayed in the Maids Head hotel which I highly recommend, lovely hotel). All in all it was an unbelievable experience, and one which will live long in the memory. Bill was a brilliant host, and the whole day was really well organised and thoroughly enjoyable (despite having to wear a shirt and shoes to the football which aint really my style). Just spoke to the Harvester across the road from the stadium. They are fine with away fans and have parking available for a fiver. Whoever finishes 3rd do get the slightly easier playoff run (probably) as Villa and WBA are almost nailed on to end up playing each other in the semis barring either of them throwing the remaining games (unlikely I would suggest). Thats for Leeds and Sheff U to worry about though as we're going up as Champions. We might be nervous, but let's make it a day to remember and get loud today. The atmosphere in the concourse pre-Wigan was unbelievable. We need that for the full 90 minutes. The Wigan game was disappointing and that filtered through to the crowd eventually. None of that today, just a wall of noise for 90 minutes regardless of what's going on in front of us. We can get these 3 points by sheer force of will if we persevere. Haha, I think returning to normal operations is a better description buddy! There was an array of bicuits available, although I didn't partake. Definitely not cheap, and definitely a one off, but a brilliant experience! Looking forward to watching the game today in a footy shirt and trainers though! Funny that you've suddenly appeared in last few weeks and seemingly have no points to get any away tickets. Almost like you're jumping on a bandwagon. Room temperature! Despite that, they were delicious. So nobody is allowed an opinion and we have to accept whatever the ‘authorities’ say. Good stuff LDC. You absolutely have pushed him being innocent and nobody being allowed to say they think he is not despite your backtracking in your last post. Afraid I’m utterly bored of your attention seeking drivel and you’re going on the block list. Cheerio. You literally say "only Henessey knows what he was thinking" then proceed to tell us we're not allowed to make a judgement on that because somebody else has made a judgement on it. FYI - it was judged by a 3 man panel - two of whom bought Hennessey's explanation and one of whom literally said it was a **** excuse (in different wording). You say your putting forward a reasonable interpretation but fail to realise that so is everybody saying he is guilty. That's why you have a reputation of being contrary. Not because you put an oppositional opinion, but because you refuse to accept there is any other reasonable stance to be taken other than your own. You accuse others of making kangaroo court judgements, whilst making your own and refusing to accept that a majority of 2 to 1 is not definitive exhoneration. In short, you're a hypocrite.